DNA methylation is one of the ways your cells control which genes to express. It is an example of epigenetic modification. Epigenetics mechanisms like this do not change the DNA sequence, only the way the genes are expressed. Whether or not DNA methylation is heritable is not clear. Cytosine is a nucleotide, a DNA building block. 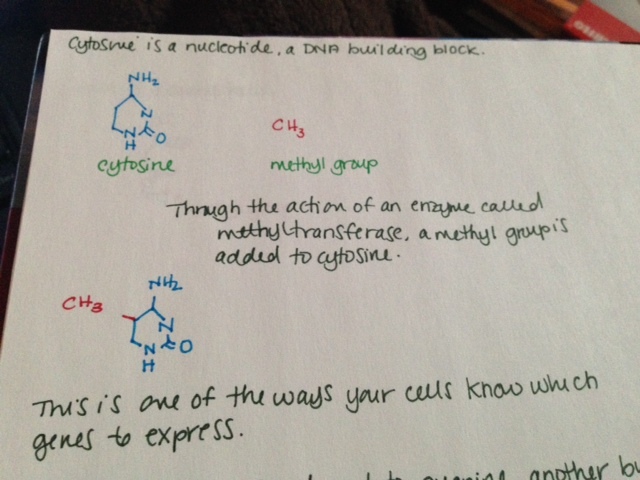 Through the action of an enzyme called methyltransferase, a methyl group is added to cytosine. This is one of the ways your cells know which genes to express. A bunch of CpG sites together is called a CpG island. These islands are found in front of genes on DNA. Special molecules called transcription factors land on CpG islands. When they do, the cell expresses the gene. 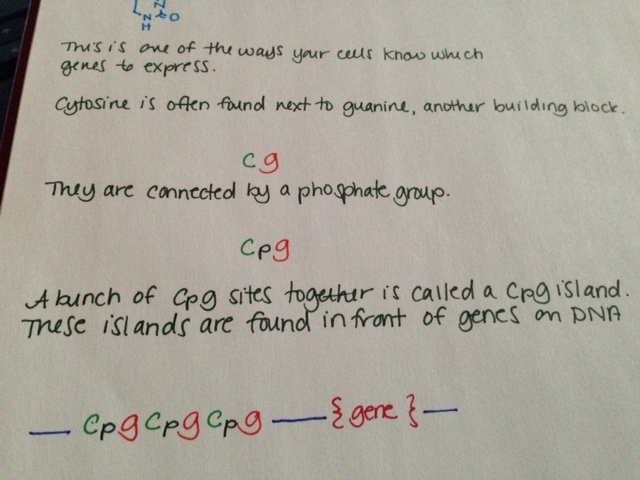 But when the cytosine on CpG islands is methylated, the transcription factor cannot bind. The gene is not expressed. Methylation is known to have an important role in cancer biology. Methylation of tumor suppressor genes causes the tumor suppressors not to be expressed, resulting in cancer. Despite having largely the same symptom profile as SM patients, people with MCAS often lack the signature D816V mutation, considered by many to be a marker of clonality and thus proliferation. Despite the fact that their mast cells may look normal under a microscope, there is now a growing body of evidence indicating that mast cells in MCAS patients behave aberrantly due to mutations aside from D816V. In three studies that look at KIT mutations in MCAS patients, they were found in 26.5%, 44% and 65% of patients, respectively. Even the average of these three values represents a significant number of people with MCAS who have KIT mutations. Of note, these mutations are mostly outside of exon 17, where the D816V mutation is found. In one patient, a mutation was found in the NLRP3 gene, associated with the inflammatory response. There are a number of other mutations in genes with various functions commonly found in patients with SM. These include genes that make proteins to regulate other genes and genes that affect how we make proteins (epigenetic regulatory proteins, splicing machinery and transcription factors.) To date, there have been no studies looking at whether MCAS patients have similar mutations. However, there are clear hints that they do. 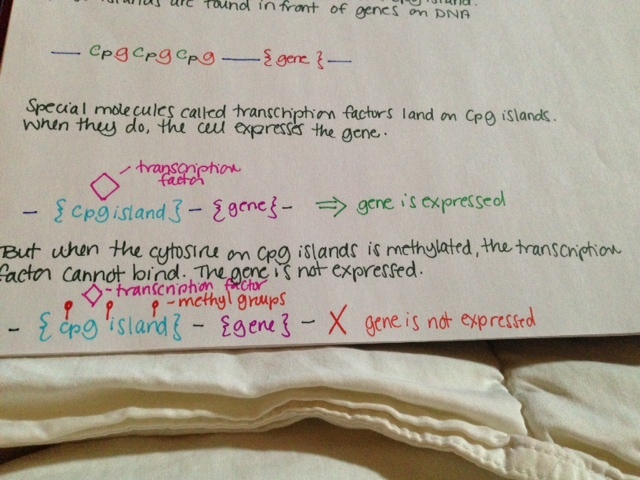 The mutations previously mentioned were all somatic and not germline. This means that the mutations arose after early embryonic development and thus were not heritable. This fact indicates clearly that there are other germline mutations not yet identified that may induce the subsequent mutations. This has been bolstered by a 2013 paper that found familial clustering in MCAS patients. An important finding is that nearly all mutations found in MCAS patients are heterozygous, meaning only one of the two copies was mutated. This implies that homozygous mutations, in which both copies are mutated, could cause the cell to die. Alternatively, the various mutations may work together to make the mutations work as strongly as if there were two mutated copies. Looking at the methylation status in the genomic DNA of white blood cells from MCAS patients shows aberrant methylation patterns. The genes incorrectly methylated included some involved in DNA/RNA repair, DNA/RNA processing, cell death, cell activity and communication with other cells. 195 individual CpG sites have been identified as candidates as markers for MCAS. Importantly, there is a correlation between the age of symptom onset and the year of birth, which indicates a sort of anticipation of developing MCAS. This means that gene regulation by methylation could affect acquisition of later, non-heritable mutations like the ones seen in KIT. A gene is made up of introns and exons. When an RNA code is made from a gene to tell the cell how to make a protein, the cell cuts out some pieces of that RNA. These pieces are called introns. The remaining pieces, which are connected back together, are called exons. The way the cell cuts the RNA and reconnects the pieces is called splicing. The mutations in KIT seen in MCAS patients almost all involve intron and exon junctions, where they meet. There are also some differences in the way splicing occurs in MCAS patients. Molderings, Gerhard J. 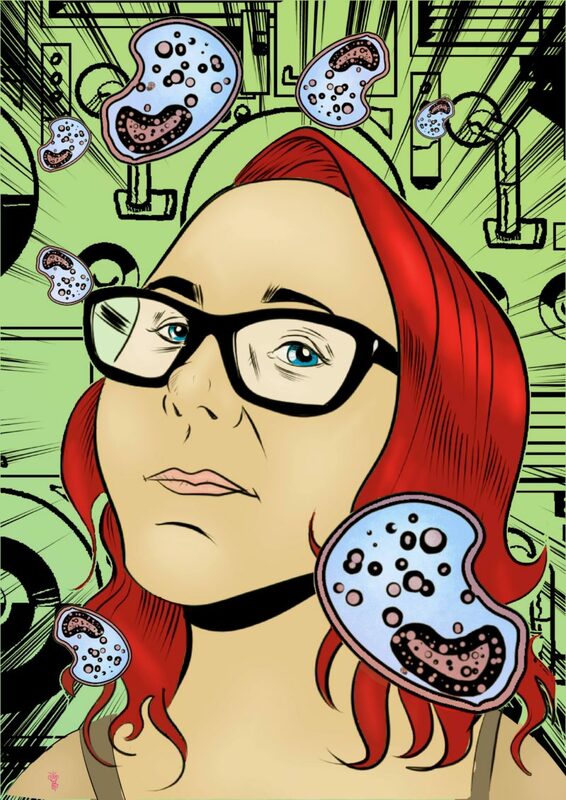 The genetic basis of mast cell activation disease – looking through a glass darkly. 2014. Critical Reviews in Oncology/Hematology.